The Soyuz MS-02 spacecraft finally launched out of Baikonur Cosmodrome in Kazakhstan after being plagued by technical problems and delays. The spacecraft, with a trio of Expedition 49 astronauts and cosmonauts, is on a two-day trek to the International Space Station (ISS). The mission was launched atop a Soyuz-FG booster at 4:05 a.m. EDT (08:05 GMT) Oct. 19 from Site 31/6. NASA astronaut Shane Kimbrough and Russian cosmonauts Sergey Ryzhikov and Andrei Borisenko were originally planned to be launched into space aboard Soyuz MS-02 on Sept. 23. However, a burned cable inside the spacecraft forced the Roscomos State Corporation to delay the liftoff until Nov. 1 and later reschedule it for the second time to Oct. 19. Intensive works on identifying and solving the problem with the spacecraft have seriously affected the crew’s preparations for the flight. When the technical issue occurred in mid-September, the primary and the backup crew (consisting of Russian cosmonauts Alexander Misurkin and Nikolai Tikhonov, and NASA astronaut Mark Vande Hei) were already at Baikonur in the midst of final pre-launch activities. After an initial assessment of the failure, Roscosmos decided to send the crews back to the Gagarin Cosmonaut Training Center near Moscow to continue training until the new launch date got closer. After the landing system cable that caused the problem was identified and replaced, the crews returned to Baikonur on Oct. 8 and resumed final training activities at the launch site. They once again tried on their Sokol-KV spacesuits, and after leak tests on the suits, they each took a seat in the spacecraft. The crews also tested the radio communications system and the laser range finder, read the onboard documentation, and studied the mission plan. Just like during the third week of September, the mating of the spacecraft to the transfer compartment, the designer’s inspection, and the integration with the rocket was carried out from Oct. 10 to Oct. 13. The rollout of the rocket took place on Oct. 16, which started final processing operations on the launch pad. While the final days before liftoff usually mean free time for the crew, engineers were busy performing checkouts of the interfaces between the onboard hardware and ground support equipment. Final countdown for the launch commenced exactly eight hours before the planned liftoff with the activation of the launch vehicle and the spacecraft, followed by system checks. Some five hours before the launch, propellant loading operations began. About two-and-a-half hours later, the crew arrived at the launch site and entered the Soyuz spacecraft and the capsule’s hatches were closed. During the final two hours before liftoff, last checks of the systems were carried out, leading to the start of the countdown auto sequence at T-minus 6 minutes. 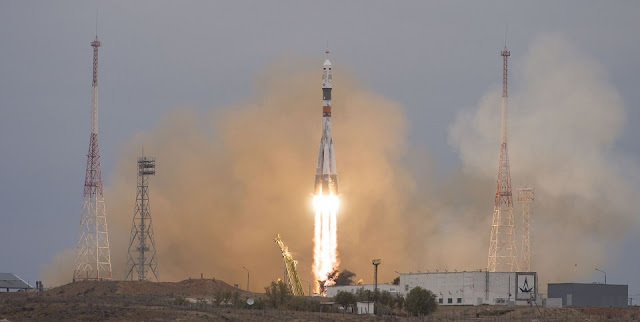 Powered by the core stage’s RD-108A engine and its four boosters, fitted with an RD-107A engine each, the Soyuz-FG rocket began a brief vertical ascent after liftoff. Next, it started heading northeasterly, to align itself with the Space Station’s trajectory. During the initial phase of the flight, the boosters helped the launch vehicle to achieve a velocity of about 3,350 mph (5,400 km/h) until they were separated nearly two minutes after liftoff. Powered by the core stage alone, the rocket continued the mission to reach another objective on its list—jettisoning the protective launch shroud, which occurred two minutes and 37 seconds into the flight. The core stage burned out and was shut down some four minutes and 45 seconds after launch. This stage was detached from the vehicle two seconds later. Almost immediately, the third stage, known as Blok-I, was ignited, taking control over the flight. Firing its single RD-0110 engine, this stage powered the spacecraft for about four minutes in order to release it into orbit, some eight minutes and 50 seconds after liftoff. Shortly after orbital injection, the Soyuz MS-02 spacecraft unfolded its communications antenna power-generating solar arrays and the control over the mission was handed over to the Mission Control Center near Moscow. This marked the beginning of a two-day trek to the ISS, during which the spacecraft will complete a series of rendezvous burns in order to align it for docking with the orbital laboratory. Cruising toward the ISS, the Soyuz MS-02 capsule is expected to complete 34 orbits of Earth and test the spacecraft’s upgraded systems. Due to the fact that only one Soyuz MS mission has been carried out before, every opportunity to test the new systems in an operational environment is invaluable for the engineers. The prolonged flight duration, from six hours to two days, will provide such an occasion for additional in-flight tests. The spacecraft is expected to dock with the space station’s Poisk module around 5:59 a.m. EDT (09:59 GMT) Oct. 21. Hatches between the Soyuz and the ISS will be opened at about 8:35 a.m. EDT (12:35 GMT). The new crew will be welcomed on board by Expedition 49 Commander Anatoly Ivanishin of Roscosmos, NASA’s Kate Rubins, and Takuya Onishi of the Japan Aerospace Exploration Agency (JAXA). The arriving crew will spend a little more than four months aboard the ISS before returning to Earth in late February 2017. They are expected to carry out hundreds of experiments in biology, biotechnology, physical science, and Earth science aboard the station. The Soyuz MS-02 mission is the first spaceflight for Ryzhikov and the second trip to space for Kimbrough and Borisenko. Kimbrough was a Mission Specialist on STS-126 in November 2008, during which he conducted two spacewalks. Borisenko flew to space aboard the Soyuz TMA-21 spacecraft in April 2011 and served as the commander of Expedition 28 during his stay on the ISS. Soyuz MS-02 is the second mission of the upgraded Soyuz-MS spacecraft. The first Soyuz-MS vehicle, designated Soyuz MS-01, also suffered a technical malfunction that delayed its launch. The MS-01 mission, which transported Ivanishin, Rubins, and Onishi to the ISS, was postponed from June 24 to July 7 due to a malfunction in the spacecraft’s system of traffic guidance. Developed by RKK Energia, the seven-metric-ton Soyuz-MS spacecraft is a modified version of Russia’s flagship Soyuz-TMA crewed vehicle. It is currently the sole means of access to the ISS. Some of the modifications incorporated into the Soyuz-MS include an improved position control engine and a GLONASS/GPS system. The spacecraft also has a new approach and docking system, a new computer, and more power-efficient solar panels. The Soyuz-FG booster, employed for Wednesday’s launch, measures some 162 feet (49.5 meters) in height and weighs an estimated 305 metric tons at liftoff. The rocket is capable of carrying more than seven metric tons to low-Earth orbit (LEO). It is a three-stage launcher that utilizes a core stage that burns throughout the first and second stage portions of the flight. Stage one is composed of the Core Stage and four strap-on boosters. These four liquid-fueled strap-on boosters provide extra lift during the initial phase of the flight. Before liftoff, all four of the boosters are ignited to reach full thrust and then are jettisoned once their fuel tanks are empty. Wednesday’s mission was the 131st flight of a Soyuz spacecraft and the third manned mission to the ISS this year. The next crew, consisting of Russian cosmonaut Oleg Novitskiy, ESA astronaut Thomas Pesquet, and NASA’s Peggy A. Whitson, will be sent to the station on Nov. 15, 2016, aboard the Soyuz MS-03 spacecraft.